Hello!!!! In case you’re wondering why I’ve been pretty quiet, it’s because I’ve been keeping most of my entries private because I’m keeping the 2nd pregnancy under wraps till we’re ready to share. Yes, you read it right. We’re pregnant with Baby No 2! We’re expecting a Baby Boy this time round. Yay Team Blue! I’m at my 26th weeks right now. Heading to the third trimester very very soon! Insha Allah we’ll be expecting him in January 2018. His EDD is 1 week after Nadya’s 3rd birthday and i’m really hoping that he stays in there till after Nadya’s birthday cos if not, i cannot eat cake. LOL. You can now read all my private entries on the IVF Cycle 2 & the Pregnancy here. Please pray for our well-being & my sanity. Getting pregnant with an active toddler is….. tiring. Meanwhile, Nadya is really excited about the baby. We brought her to the detailed scan appointment & when she saw the screen & adik on it, she shrieked “Ehhhh… baby!!! mummy!!! Baby! !” So loud k and each time she chances upon the scan pictures of her adik, she’ll say “aaaaawww so cute baby.” Ye lah. adik kau sorang je yg cute. This pregnancy is really different so i had a feeling from the start it could be a boy but i didn’t wanna get my hopes high up cos i cannot be thaaaat lucky. But i prayed for a baby boy this time round. Just like how i constantly prayed for a baby girl the 1st time round. Allah is great indeed. It’s also quite tiring this time round & i’m sure it’s because i’m older now & i take care of Nadya full time? Toddlers are exhausting. I want 40 weeks to come by fast but i also want to enjoy the moment because this might be my last pregnancy cos i don’t think i want to go through IVF again. Tapi kalau nak suruh aku beranak 6 memang tak lah. Kalau kena semua active cam Nadya….. But i guess this pregnancy i’m really not as kancheong macam when i’m with Nadya. With Nadya, i google every single thing & always worrying about everything. This pregnancy, i know what to expect & i’m more comfortable with what i’m feeling. But i still get excited over Babycentre notifications still & i still do worry but not so much lah. We went for our detailed scan at 22 weeks & Alhamdulillah everything looks fine. We also managed to know the gender! I passed my Gestational Diabetes test the last time round but not sure if i’ll pass the next test when i go for the next blood test end of this month. One thing for sure, this pregnancy is going reaaaal fast this time round. Can’t believe i’m entering my Third Trimester this month! So exciting but yet still so scary? I think you’ll feel the same way for every pregnancy cos you don’t know what to expect and we all know not all labours would be the same kan? I hate that part. The not knowing what to expect cos i want to be prepared. Also i’m really hoping i can breastfeed longer this time round, but again not pressuring myself. I’ll take whatever i can. So far we’ve not bought anything much for Adik. Except for a Tula blanket & a camouflage hoodie cos it’s cute, although not quite necessary. Hahahaha. I believe we’ll reuse most of the major items like baby cots, strollers etc. We just need to get small items like clothes (yay! ), pillows, bottles etc. I also tried switching on my Spectra Breats pump & it’s still working. HAHAHHA. But i need to get all the spare parts like tubes & flanges cos i have no idea where i kept everything. Maybe i’ll check at the Baby Fair or Pupsik etc and see if there’s a promo! I’m 16 weeks pregnant now & officially in my 2nd trimester. That was fast! Went to NUH to do my 1st OGTT. Because I have a history of Gestational Diabetes when I was pregnant with Nadya, they put me at high risk for gestational diabetes again for this pregnancy. I was initially reluctant to take two tests but deep inside I also want to make sure that if I have early GD, it can be detected early so I can control my diet again. Not too scared about the baby being too big that I’ll have to go under the knife or anything. But scared if the baby might end up having low blood sugar during birth. The dreaded orange drink! Urrrgh. Tastes even nastier this time round cos I seem to want to puke at everything. So I was told to from midnight and report to Clinic G at 9.00am and take my 1st blood test at 9.30am & drink the glucose drink within 10 minutes. The 2nd blood test will be taken at 10.30am and the last blood test at 11.30am. Managed to see the gynae after my 2nd blood test to hear the baby’s heartbeat. Felt so relieved because at this point I’m still unable to feel baby’s movements yet so hearing the heartbeat reassures me that the baby is fine. I’ve felt quickenings though. That flutter feels and I can hardly wait to feel actual movements because I really miss that. So far everything is going fine except my headaches are still here and they’re really persistent. They can go on from morning to night and I’m still so tired most of the time. A bumpfie at 16 weeks! I’m also showing quite early this time round maybe cos this is the 2nd pregnancy. We’ll also be switching to the Private clinic when I see Dr. Citra come September. I have no problem with the subsidized clinic this time round but I prefer seeing Dr. Citra again and also we would want to take the A1 class again when I deliver so it’s just a preference. My detailed scan is scheduled 3rd week September so maybe we’ll find out the gender then. We’ll probably announce our pregnancy then as well cos the tummy is bigger now and it’s harder to hide. Lol. Would anyone be kind enough to recommend me Birth Classes, preferably by a Muslim Doula etc? NUH hold Antenatal Classes but i would prefer something more errr.. spiritual? How do i put it eh? Something that is not so clinical because i foresee the content at the Antenatal Class at NUH would be something i can get off from Google. I was set on attending Yaqyn Birth Classes cos Rina went and gave good reviews but i was a little too late cos by the time i’ve decided to attend, Yaqyn has stopped all classes for this year as she is in her last trimester and giving birth anytime soon. I didn’t wanna go too early, scared that both me & Rusly would kind of forget about the things we’ll learn at the classes. Was looking forward to classes in November / December. Might be registering for the Breastfeeding Classes by Blessed Beginnings soon because i’m keen to breastfeed and would like to prepare myself mentally for that and maybe also cos i kind of needed the push? I’ve been reading how some new moms suffer from breastfeeding and give up halfway and i just needed to know how i can overcome all these. I know some MTB think that these classes are not necessary because if other mothers can survive motherhood without going to these classes, then i should be able to. I can already conjure up images of people who would say that to me actually, but to each her own really. I think i’ll benefit from these classes and it’s a small price to pay for the knowledge i’ll acquire. No i did got into a tub and do a rub-a-dub-dub per se but i went for my 2nd pre-natal massage today! i did my 1st pre-natal massage at 22 weeks because nobody would massage any pregnant woman if they are not at least 20 weeks. My 1st pre-natal massage was done by Pre & Post Natal Massage and it was a home service. Nothing to shout about so i didn’t blog about it. It wasn’t very bad but it wasn’t spectacular. I rate massage service by how relaxed i feel during and after the massage. If i fall asleep during the massage, then it’s good enough for me because i have very unusual sleeping pattern, i don’t fall asleep very easily. Secondly, because it was done on my bed and my bed is quite low, it was a bit difficult for her to move around etc and i didn’t feel much relief after the massage. In fact i was aching all over. Macam kena langgar truck. After she left my place, i slept and woke up aching all over again and i had subtle cramps. But they said it’s normal to feel like that after a massage cos of the blood-flow etc. My massage therapist, Alle asked which area i prefer to concentrate on and i told her mainly my lower back and my hips area. They were aching so bad! There’ll be days i can’t even roll over in bed because it was aching too bad. So Alle concentrated on that area immediately and i fell asleep shortly. The pressure was just nice. Usually, i would have requested for a harder pressure but Rusly told me to be mindful and not go overboard with the pressure. Partly also cos the lower back is quite sensitive for the baby especially if baby is facing the back. With pre-natal massage, instead of lying flat on your tummy, you’ll be asked to lie down on your sides and they’ll have a long bolster for you to hug and place your legs on and they won’t touch your tummy at all. Price-wise, i got a trial session from them at the Baby Fair at $39.00 only but the usual price is $150.00. Expensive i know. But they were promoting a Pre-Natal package at $399 for 5 sessions and it’ll work out to be around $80.00 per session which is fine for me because that’s the average of what i usually pay for my monthly massage. I’ve not really decided if i should take up the package. I did place a $50 deposit but if i decide not to take up the package, i just need to top up another $100 for 1 pre-natal massage session. According to them, i can do the massage till 37 weeks. So that’ll be a once-every 2 weeks massage session till i reach the full term. Very tempting if you ask me but not sure if i really really need it. if i do take up the package, i’ll take it as a pampering session before i give birth. Wanted to draft this post earlier but was too busy to! For the past two weeks, i went to two baby fairs and have striked off almost 80% off the items on the Baby List. Alhamdulillah.. Kind of relieved because i think the exhaustion is setting in. I’m getting lazier to do stuff / go out especially with the weather. The day we collected all our pre-orders. I insisted Rusly bring the delivery trolley and i wished i brought my luggage as well because we bought some other random small stuff as well. The 1st trip in, we went in with the trolley to carry all the bulky items and i really mean bulky! We didn’t bring that supermarket trolley though. 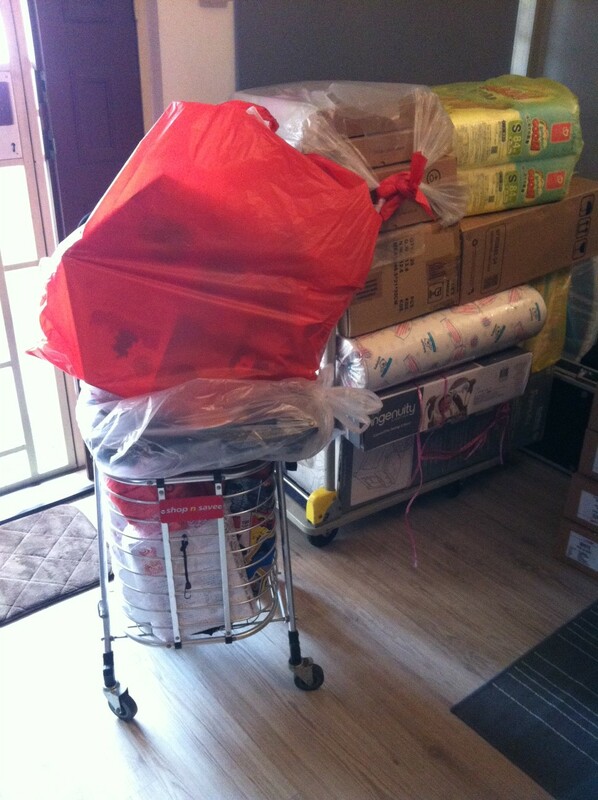 Only used it to transport the items from our void deck & back up to our place. Insha Allah next week, we’ll bid adieu to the 2nd trimester and forge ahead to the third trimester. Had my Glucose Test yesterday to detect Gestational Diabetes. It is not a compulsory test but Dr Citra ordered that for me and for a peace of mind and since it’s non-invasive, i figured why not? Finally did the 1st blood test at 10.05 am. I thought it’ll just be a prick on my fingers but turns out they had to draw out a tube of blood. After drawing out the 1st tube, i was required to drink a bottle of Glucose drink. SO SWEET! It’s like drinking Orange Cordial with 20% water. Really sweet and concentrated. But at that time i was really thirsty so manis pun telan je lah. While drinking, one of the Lactation Consultant was making her rounds and randomly asked if i’m free to have a brief consultation on breastfeeding. Of course i said yes! It was quite an enriching session. Managed to ask her of my concerns, especially because i’m already leaking colostrum since 23 weeks or so. She reassured me that it’s fine and a good indication of good milk supply. Insha Allah. I really hope so! But she warned me not to try to pump or hand express it before birth because it will induce contractions. Nurse told me they’ll call me if the test comes back abnormal and i’m hoping they won’t call me! Like really really, DON’T CALL ME ah please. I don’t know know why i’m paranoid over GD. Maybe because my mom had it during one of her pregnancies and also because i’m overweight. Before i forget, baby been doing this rhythmic bumping lately and i thought it was one of her kicks and i was just wondering how come it happened so often and so rhythmic and then Dr Citra told me yesterday it was her having hiccups! HAHAHA So cute don’t know for what! Sometimes when it happens, i’ll stare at my bump and see it going up and down. Weight-wise, i lost another 3 kg from the last visit. But i wasn’t too bothered about it already ah. Dr Citra said nothing to worry and that means i have lesser weight to lose post-natal. As long as baby is growing, i’m ok lah. Next scan will be at 28 weeks for my growth scan and also to check on my amniotic fluid since it was classified as subjectively low during my 21st week scan. I’ve been drinking a lot of water since then so hopefully the situation is better now. I think i’ll miss the 2nd trimester a lot and hopefully the 3rd trimester won’t be so awful.